One of Hip-Hop's newest artists unveils his new release called, "The Introduction Mixtape". In today's market of hip-hop is filled with derogatory and violent rap. What sets Lyrically Twisted is his message which he . 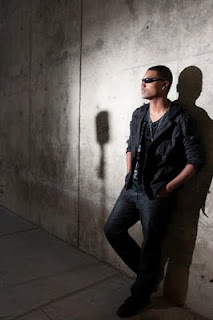 His message is clear in his lyrics, compliments with a smooth jam of hip-hop style music to keep the listener entertained. Each track is a mastery of sound and One of Hip-Hop's newest artists unveils his new release called, "The Introduction Mixtape". Today's market of hip-hop is filled with derogatory and violent rap. What sets Lyrically Twisted apart is his message. This is what Tyrone Stokes calls the “New Generation of Hip Hop. His message is clear within his lyrics, complimented with smooth jams of modern style hip-hop to keep his listeners entertained. Each track is a mastery of mixing and effects with perfecting fading and beat placement in every song. This style is really showcased in tracks like, “Gotcha Right Here”, “Who Would I be”, “New Generation of Slavery”, “Can’t be Stopped”, and “The Champ is Here”. Congratulations on your recent release of “The Introduction Mixtape! How does it feel to have finished your first big project? It feels great! This is my first big project and it has motivated me to keep pushing and stay persistent in what I want to do with my music. I worked with a lot of good people on this Mixtape and I am grateful that it was a success. Have you had a release party or was it low-key? No I haven’t had a release party. I was only releasing a Mixtape that is a free product for promotional use so I didn’t want to go all out. For my album, I will definitely have a release party though. In a recent interview with Brittani Jackson, you mentioned that you came up with the name “Lyrically Twisted” while free styling to yourself one day. Could you go more into depth with this? Ever since I started rapping, I’ve always free styled to myself for practice. This helps me to think quickly about rhymes and lyrics and it also expands my vocabulary. And as I said in my other interview, I was free styling one day and I kept saying “I’m Lyrically Twisted” after every couple of sentences. Eventually, it started to make sense to me and I attached meaning to it as a confirmation of my self-identity. I am a positive and inspirational hip-hop artist who attempts to “twist” the linguistics of generic rap lyrics into something more meaningful. And I’ve made sure that I self identify with my stage name in every song I write. How many different names did you go through before you were stuck with LT? I only went by one name before my current stage name, which was my last name “Stokes”. I went with this name because I didn’t have an artist name, but my father is very popular in the city of Pomona and local areas because of his ability to dance (Poplocking), so I decided to use it because it yields some significance. I didn’t go by LT until my freshman year in high school. You’re a senior at Cal Poly Pomona, correct? What is your major? Does it anyway tie into your music career? Yes, I am a 5th year senior at Cal Poly Pomona right now. My major is Communications with an emphasis in Public Relations. This major really does tie in with my musical ambitions because I learn a lot about communicating with people in general and about various aspects of the media. I feel that communication with people is what I do as a lyricist so it’s a pretty good fit for me. Plus, I enjoy learning about different aspects of the media, which I believe is very influential in affecting the beliefs and lives of people. I heard somewhere that you also perform poetry. Do you do this in a public setting or privately? Is this something you still do? Yes, I do perform poetry. I love it! I started writing songs because of the poetry I was writing back in the day. I decided that my poems would sound nice over music and that’s when I started rapping. So even when I perform my poetry now, a lot of my pieces are also songs that I’ve written and vice versa. Can people come and see you perform poetry, if so where? Yes, I occasionally perform at a venue called Mic and Dim Lights in Pomona located on 2nd street. I also perform at a venue that myself and others have created on Cal Poly Pomona’s campus called Unplugged, which is every Tuesday night at 7pm in the Games Room. You have somewhat a cleaner style of hip-hop. Did you find it difficult to write clean lyrics versus the “stereotypical” rap that goes on today? No, because writing rap songs with significance is something that I find easy for me to do. However, it might be difficult for some because if one is going to write lyrics that yield significant meaning, then he or she has to think critically about what he or she is saying and “how to say it”, which I believe most rapper’s do not do. I feel that they simply mimic the “stereotypical” rap songs and try to get rich quick, rather than taking the time to put forth something meaningful risking the chances of labels not wanting to sign them because they feel that kind of music isn’t salable. So overall, I would say it’s more difficult for some people to write “meaningful” lyrics because you have to be conscious of what you’re talking about and for me…it comes natural. What inspires you to write what your lyrics? Experience, human nature, stories, relationships, and spirituality. These 5 things are what inspire me to write what I write in my songs. With experience pertaining to a particular subject matter, I can easily convey different situations that either happened to me or that I’ve seen happened to someone else. I also love to “watch people”, but not in a scary or stalking way! It’s intriguing for me to watch how human nature plays out…how people interact with one another in various situations. When I write my songs, I use a lot of what I have seen and how I personally perceive human actions. Story telling is something that I believe started the Rap Phenomenon in the first place and is one of the best ways to display creativity and grasp a listener’s attention and that’s why I write songs that are also stories. I furthermore enjoy learning about Relationships that deal with two intimate lovers. I enjoy the good and the bad of relationships because I believe that they teach you a lot about human nature and about yourself. You can learn a lot about yourself by being in relationships and that is why I write about them in my songs. Lastly, Spirituality is a big thing for me because I am a man of faith. I’m not necessarily religious, but I do feel that I am spiritual in many different ways and often times, without even trying, it shows in my music. What is the general message in your music? The general message in my music, overall, is for people to listen, think consciously how it relates to them or simply the world we live in, and to spread Positive Inspiration to those who care to listen. 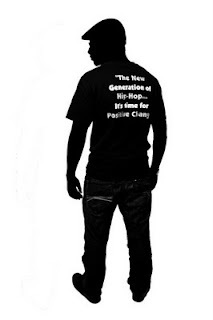 Furthermore, the overall message in my music is that I am making an effort to change the negative connotations associated with the Hip-Hop genre into something more meaningful and positive and I would hope that those who listen to my music would understand that concept. Do you foresee a future in hip-hop or is this just a hobby? I definitely foresee a future in hip-hop. I have many hobbies, but performing and writing hip-hop music is my main goal in life and I will continue to be persistent in making such a dream…a reality. Do you have an agent? If not, are you looking for one? No, I do not have an agent. I have a manager right now who handles various duties, but an agent who is strictly concerned with my success and knows what he or she is doing, would be great to have! Since commercial hip-hop is not what it used to be, do you want to stay an independent artist, or are you looking for a record label that can bring you into mainstream? This is a question I get asked a lot! People want to know if I’m trying to get “signed” or not. To be honest, I’m still not 100% sure whether I want to get signed to a major label or not. In the future, I do want to be in the “mainstream”. I want to be in the media so that I can reach out to millions of people. As for now, I’m trying to do everything myself (along with my team) in regards to production and publicity. I am, however, looking to get a Distribution deal in the near future. A good distribution deal would mean that a distribution company would distribute my music across the U.S. as well as deal with the marketing and promoting of my music. I would have “in-house” production so all I would need is for a Distribution company to distribute my music more efficiently than I can without one. So a distribution deal would be ideal. However, if I was approached by a record company executive who wanted to sign me to a label, I would have to look thoroughly through the contract and what I would be offered to make that decision because I understand that the music industry isn’t what it was years ago and if I’m not careful, I good get taken advantage of. This is why everything involving my music is done by myself and with a team of people I trust. Who was your favorite artist(s) growing up? Ironically, growing up, I didn’t listen to too many artists in the hip-hop genre. I listened to my father most of the time because he was doing music a lot (conscious hip-hop). I also got into Tupac Shakur and DMX when I was younger because they both had really vivid and meaningful messages. To be honest, I was more into R&B songs because I felt that more R&B music had significant meaning to it than the rap music that was out during that time. Furthermore, there was one particular artist that had a little bit of influence on me wanting to rap, and that artist is Too Short. Now, I know that a lot of people know Too Short for “certain songs”, but when I was younger, I heard one of his most famous songs called Life is…Too Short. This song is a very inspirational piece and yields a strong positive message. I encourage everyone to look this song up because it is a lot different the kind of songs he puts out today. Do you listen to anyone from today’s market? Today, I try my best to research various artists so that I am conscious of who is in the game right now and how they are becoming successful. There are 3 main artists I focus on today who have been successful in the music industry in their own ways and those artists are Talib Kweli, Lupe Fiasco, and Black Ice. I listen to these artists because I feel that I can equate my style with theirs. Not to say that I yield the same style as they do, but that my beliefs and creativity are very similar to what they bring to the hip-hop industry and I can learn a lot from them. The final song on your Mixtape entitled The Introduction is called, “The Conclusion”. Is this end of LT or are you working on another project or Mixtape? The Conclusion is one of my favorite tracks on the Introduction Mixtape because it is so creative! I don’t know how many people may have caught the message behind the song, but if you listen closely, I speak on every single track from the Mixtape from track number one to the conclusion. Just a side-note… But this is definitely not the end of what I’m trying to do in regards to my music. I am working on a couple different projects right now and haven’t decided whether I want to release another Mixtape or drop my album sometime next year that I’ve been working on for a while now. So only time will tell…so stay tuned! Do you have any tour dates coming? I’m actually planning a tour, but as for shows in general, I am booking a lot of shows right now and I have 2 shows that are confirmed. One of these shows is a hip-hop show at 2nd Street Jazz in downtown LA on October 4th at 9pm. The other show is a competition called “The Big Stage Live”. More details on that will be posted on my facebook, myspace, and official website soon. Last question for you: I love your official T-Shirt. 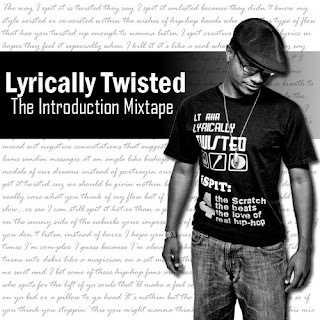 Where can I get a hold of a Lyrically Twisted T-Shirt? I am actually getting some T-Shirts made for merchandise during performances so if you would like a T-Shirt, be sure to check www.LyricallyTwisted.com and when the shirts are available, they will be on the site for purchase. Be sure to check out a special 4-track preview of Lyrically Twisted on The Great Unknowns Presents.